I’m back to the archives again this week for Foodie Friday. 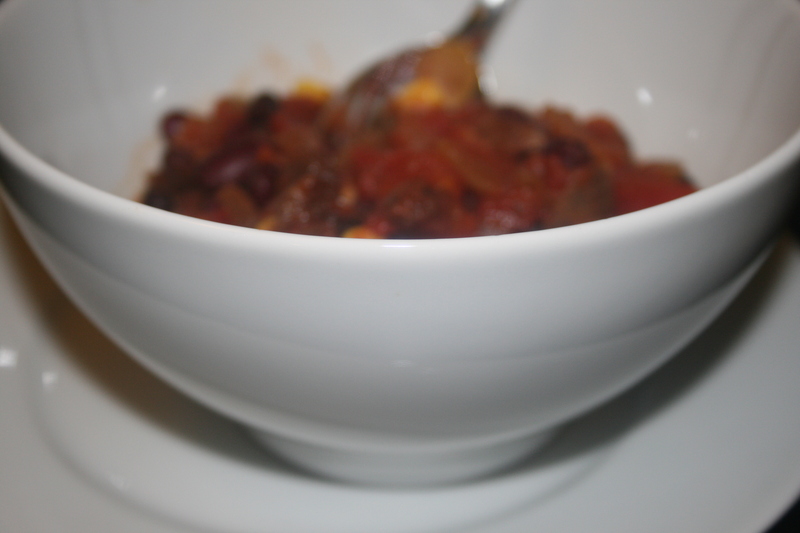 Because this winter doesn’t want to end, I figured a good chili recipe is in order. I originally shared this one back in 2011, thanks to the generosity of George Vutetakis, former Executive Chef and owner of the Inn Season Cafe. You can find him today at thevegetarianguy.com. Growing up in Michigan, when the long winter set in, we could always count on a hearty, warm batch of chili to be on the menu. Chili was a perfect option for feeding four growing kids without breaking the bank. It was a simple, low maintenance meal (unless my dad was making it – more on that to come!) that didn’t require too much time, plus, it was one of those dishes where the leftovers actually tasted better than the initial offering. There were two versions of chili we enjoyed growing up. One was a standard kidney bean and ground beef variety that was passed down to my mom from her father. The other was my dad’s version, which was never standard. It was usually a concoction of whatever struck my dad’s fancy that day (often whatever he could find in the pantry or freezer). Dad’s chili was typically heavy on the meat and spice, a man’s chili. In fact, the first time we usually saw this chili for the season was when my dad was preparing for his annual trip with the guys to deer camp (or was it beer camp???). When dad was cooking his chili, we usually stayed out of the kitchen, because it tended to look like a war zone when he was finished. I guess I know where I get it! After my family first went vegetarian a few years back, we were invited to my parents’ house for their standing Sunday dinner with my siblings and their families. My mom forewarned us that they were planning on making chili with mashed potatoes (a favorite combination growing up) and that we would need to fend for ourselves if we wanted to eat anything other than mashed potatoes. My mind went instantly to our favorite chili recipe, Inn Season Chili, from one of the first vegetarian cookbooks I purchased, Vegetarian Traditions, by George Vutetakis. George was the executive chef, and eventually owner, of the Inn Season Cafe in Royal Oak, MI for nearly 20 years. Inn Season Cafe is legendary in Michigan’s vegetarian/vegan community and beyond; and it is the patriarch of many of the organic, raw, vegetarian, and vegan restaurants that have sprouted in metro Detroit in the years since its founding in 1981. Like the meat chili’s I grew up with, the Inn Season Chili is hearty, flavorful and filling, perfect for warming chilled bones after a day working or playing in the winter weather. But this isn’t a chili that is trying to imitate the flavor and texture of meat chili. 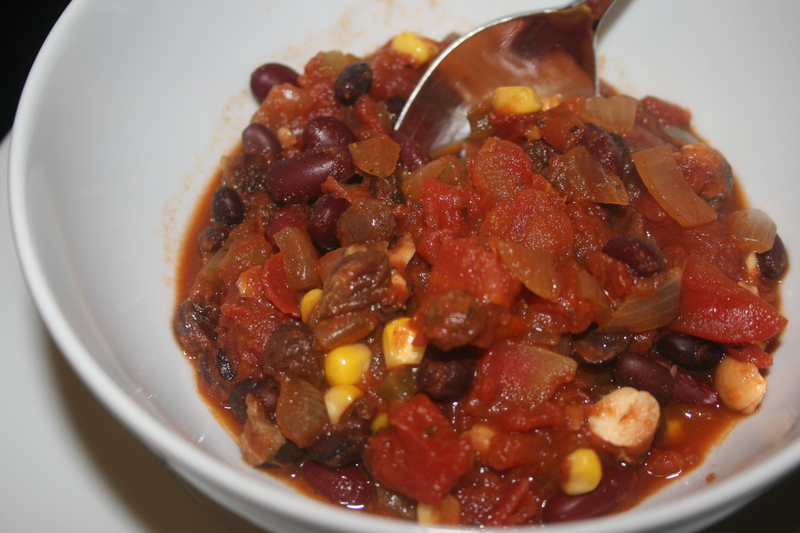 It is a completely whole food, plant-based chili that derives its flavor from layering a plethora of spices and seasonings on top of a combination of fresh produce, legumes and nuts. The result is a chili that is homey and comforting in one taste, yet transports you to someplace more exotic and unfamiliar with the next. I had no qualms about bringing this amazing chili to sit beside its meaty cousin at Sunday dinner, and when we returned home that evening with an empty pot (and no leftovers to rely on for the rest of the week) my instinct was validated. 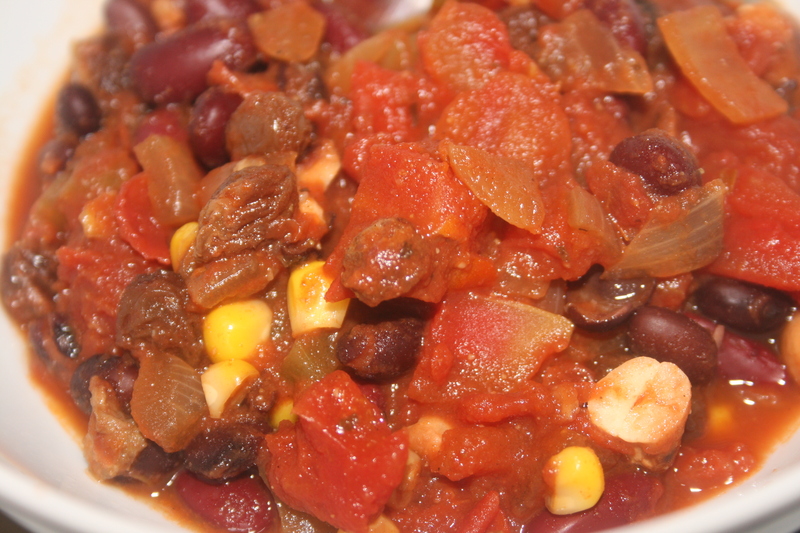 When I started this blog, several relatives asked me if I was going to share my chili recipe. Fortunately, I was able to contact George and request his permission to share his fabulous creation. I am grateful for his graciousness in allowing me to share with you all the famous Inn Season Chili recipe. I hope you and yours enjoy it as much as we do! Reprinted from Vegetarian Traditions, Copyright 2009, with the permission of its publisher, George Vutetakis, thevegetarianguy.com. Add cashews, sea salt and beans to the soup mixture. Simmer for another 15 to 20 minutes uncovered. Serve hot. I try to make this recipe as it is written with fresh tomatoes and beans; however, if you are like me and for some reason cannot seem to take dried beans from dry to edible on occasion (don’t ask me why, it’s so simple), I suggest keeping some canned black beans and kidney beans on hand as a backup. I’ve had to use them from time to time and the chili is still delicious.